You runnin’ a festival? You want tee shirts? You don’t wanna spend lotsa bucks up front on lotsa shirts then have lotsa leftovers! 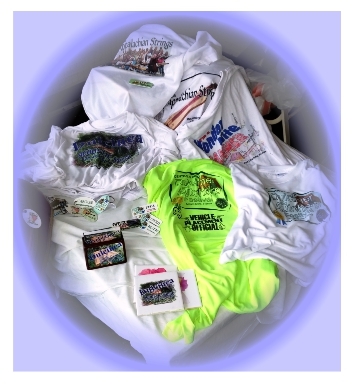 We print only the shirts you need - right there, On-Site! If you like, we do design and photography at your festival. Festival art, instrument bag ID tags, name tags, etc. right there. No up-front costs, no leftovers, what-a-deal! We setup in your vendor area or at our motorhome on site. If you add a pre-order, pre-pay line to your registration form for shirts, name and ID tags, then you include the items in the registration packets for pickup at check-in. During your festival, participants who want shirts or custom name tags or instrument ID tags with your festival logo and their own instrument photo on them, we do that. WHOA, you can do that?? We do that all the time! We snap your picture, design the layout and print the items right there during the festival. All of our services offered at festivals are also available to anyone either on site or via email anytime. We design and produce custom Name Tags, Bag ID Tags, Shirts and more for individuals, groups and organizations across the country.